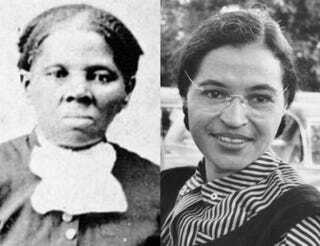 Harriet Tubman or Rosa Parks may be the next face featured on the U.S. $20 bill—that is if Women on 20s (W20), a grassroots organization committed to the realization of female representation on the nation’s currency, has anything to say about it. Yes, it absolutely does, and that “something” is not black women. No amount of subversive symbolism changes that fact. This country was founded on the idea that all white men are created equal and no one else. As such, Andrew Jackson—slave owner, seventh president of the United States and current face on the $20 bill—represents exactly the values and ethics upon which this country was founded. You can put lipstick on a pig, but it’s still a pig—the pig in this case being a capitalist structure hell-bent on the expansion, maintenance and protection of white supremacy at any costs. When nearly half of all single African-American women have zero or negative wealth, and their median wealth is $100—compared with just over $41,000 for single white American women—it is an insult. When black women are the fuel for the prison-industrial complex, with incarceration rates increasing 800 percent since 1986 and black girls being the fastest-growing population of a corrupt juvenile-criminal system, it is an insult. When African-American women earn on average 64 cents (pdf) for every dollar paid to white, non-Hispanic men, compared with the 78 cents that white women earn for every dollar paid to white, non-Hispanic men, it is an insult. And frankly, putting a white woman’s face on a bill would be akin to Hillary Clinton becoming the president of the United States: a woman’s face on the same old racist, patriarchal political system that continues in both insidious and blatant ways to disenfranchise women and people of color. Women on 20s has stated that its goal is to petition the White House to make the change by 2020, the 100th anniversary of the ratification of the 19th Amendment, which purportedly gave all American women the right to vote. Let’s be clear: Not all women are white. Not only did African-American women face discrimination within the women’s suffrage movement, but we most certainly did not attain the right to vote 95 years ago. After decades of literacy tests and other disenfranchisement tactics, it was the Voting Rights Act of 1965 that finally allowed African-American women to vote somewhat freely—the same Voting Rights Act that in 2014 was gutted by the Supreme Court. Although I’m sure that Women on 20s and its approximately 256,000 voters mean well, the very narrow lens through which they appear to view gender equality and sociopolitical progress leaves very little room for the lived experiences of black women throughout America’s history and into the present day; in fact, it erases them.